This volume concludes the story of a family that becomes alive once again through their descendant’s hard work and determination to tell their tale. 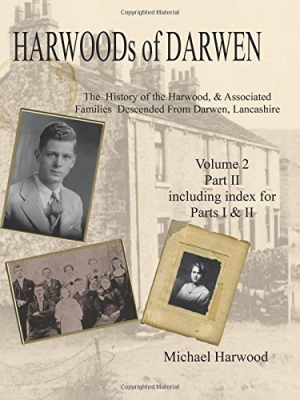 The Harwoods of Darwen: Volume 2, Part II is a study in how one man’s determination to track down his ancestors can produce amazingly detailed results. Michael Harwood’s final installment in his family history examination follows the Darwen family from the mid-1800s to the mid-1900s. This lengthy conclusion to Harwood’s quest provides a wealth of information gathered from censuses, libraries, historical collections, and inquiries around the world. Comprehensive family trees track the different branches of the family that splintered from the original Lancashire line to head to Western Australia and to India, where one of the ancestors accepted a job in India’s booming textile industry. Covering a rich time in world history, the book touches on everything from the rise of cotton mills to the introduction of automobiles—and the inadvertent deaths they caused—to fascinating details about the Harwood family members who served in World War I. It also includes brief mentions of World War II. Along with family trees, the book also includes family portraits, pictures of family headstones, personal handwritten letters, obituaries, police reports, and business documents. Writing, though mostly factual and businesslike, includes some funny asides, like: “They struck up a relationship which developed into more than just holding hands. In fact it developed into a surprise pregnancy.” Harwood always finds new and humorous ways of describing the pregnancies, many of them illegitimate, that his ancestors experienced. There are many places to pull information from in the book, which is an invaluable resource for anyone connected to to the family, or even who is conducting research into the eras it covers. Health concerns of the time, such as “softening of the brain,” “retention of urine,” and tuberculosis are described in detail. Other manners of death, such as falling down the stairs and multiple accidental burns, are also described through court cases, police reports, and the author’s own descriptions. Wrapping up with the author’s declaration that he is done writing about his ancestors—and who can blame him after a thousand-plus pages of incredibly researched material?—this volume concludes with a detailed index of surnames and place names mentioned throughout all of the books and an index of burials, places of worship, and details and locations of military battles. This in and of itself would be a valuable source for anyone seeking information about neighboring families.